Guitar Blog: Gibson Explorer Shadow Bass from 1986 - but where are the pickups? Gibson Explorer Shadow Bass from 1986 - but where are the pickups? Graphics like these appeared on a number of mid-1980s Gibson Explorer guitars and basses, but more unusually this 1986 Gibson Explorer Shadow Bass appears to have no pickups. Of course, it does have pickups but not of the magnetic variety that you'd usually expect to find on a solidbody instrument; the bass features piezo elements in the bridge saddles courtesy of Shadow pickups. This specific model bass was produced in very small numbers, and were apparently only in production for one year. 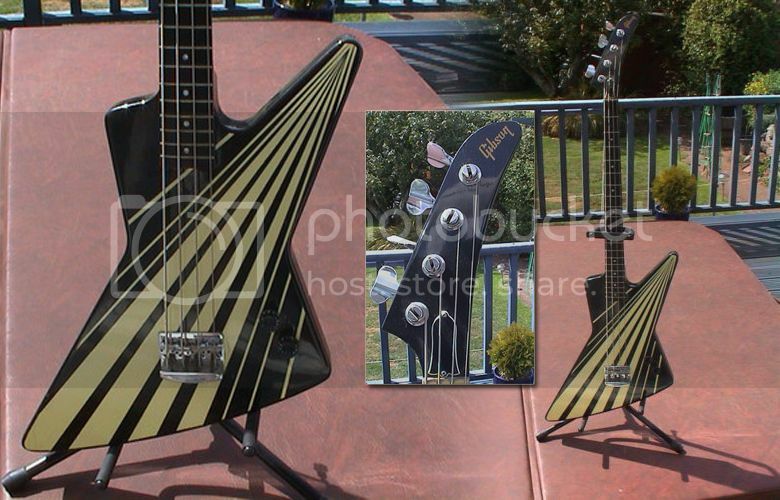 This bass is currently listed on eBay UK with a Buy It Now price of £1,075 (approx $1,690 USD at the time of writing). Another example is listed by an American seller on Vintage & Rare and priced at $2,500.